The burrs begin to dehisce between mid September and early October (depending on the cultivar and production area) shedding the nuts. Chestnuts should be picked up daily during the harvest season to minimize fungal infection and growth (if infection occurred while the nuts are still on the tree) and loss of quality due to excessive drying and/or sunburn. Use of a tarp below the tree can reduce contamination of the nuts due to direct contact with the soil. Alternatively, a mechanical shake-catch harvester can be used. Following harvest the remaining burrs should be removed. 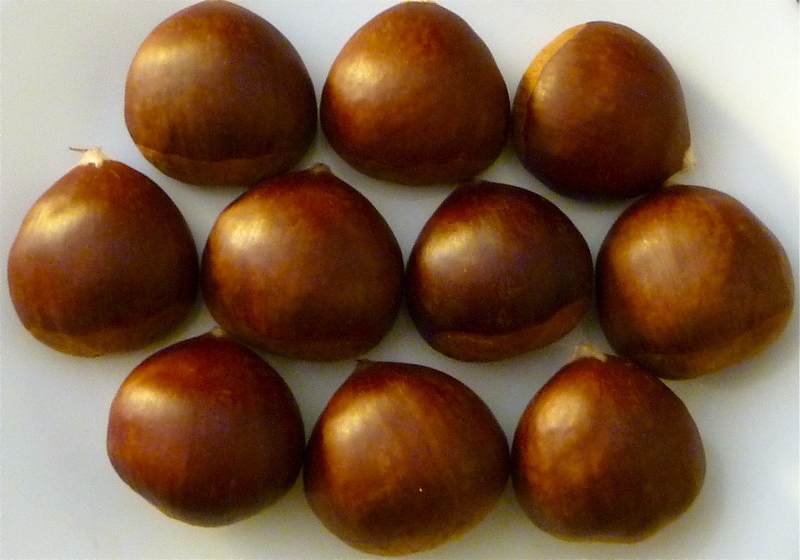 Fresh chestnuts contain 40 to 60% moisture and should be handled with care to avoid mechanical damage. -1 to 0°C (30 to 32°F); highest freezing point is -2°C (28°F) for European chestnut and –5°C (22°F) for Chinese chestnut; prompt cooling to 0°C (32°F) is strongly recommended to stop decay development and preserve quality. 90–95%; packaging in microperforated plastic film is highly recommended to minimize water loss from fresh chestnuts. To calculate heat production multiply ml CO2/kg•hr by 440 to get Btu/ton/day or by 122 to get kcal/metric ton/day. Preharvest or postharvest exposure of burrs to 50-100 ppm ethylene gas or 500-1000 ppm ethephon (ethylene-releasing liquid) accelerates dehiscence. There are no reported effects of ethylene on the nuts. An initial exposure to 40-50% CO2 for 5-7 days at 0°C (32°F) followed by storage in a CA of 2-3% O2 + 15-20% CO2 is very effective in preventing mold growth, sprouting, and other quality deterioration factors. Exposure of fresh chestnuts to <1% O2 results in fermentative metabolism and off-flavor development. Under optimal temperature of –1 to 0°C (30 to 32°F), relative humidity (90-95%), and CA (2-3% O2 + 15-20% CO2), fresh chestnuts can be stored for up to 4 months. Sprouting results from exposure to high temperature and humidity and can be avoided by using optimal storage conditions. Use of effective preharvest integrated pest management program to control incidence and severity of insert infestations and fungal infections. This IPM program should include strict orchard sanitation which can also help in terms of food safety by minimizing microbial contamination. Minimizing the time during which the chestnuts are on the orchard floor and avoiding their direct contact with the soil to reduce fungal infection and growth as well as possible contamination with human pathogens. Washing the nuts with chlorinated, or otherwise disinfected, water followed by a hot water dip: 50°C (122°F) for 30 minutes or 55°C (131°F) for 15 minutes or 60°C (140°F) for 5 minutes. Following the heat treatment, the nuts should be cooled to 0°C (32°F) using forced-air cooling, which will also remove any surface moisture from the nuts. An alternative to heat treatment is exposure of the nuts to air enriched with 40-50% CO2 for 5-7 days at 0°C (32°F) since CO2 is a fungistatic gas. This treatment can be followed by storage either in air (for up to 3 months) or CA (2-3% O2 + 15-20% CO2) for up to 4 months at –1 to 0°C (30 to 32°F) and 90-95% relative humidity.